Nationwide protests against Donald Trump have erupted in the day since he was elected President. 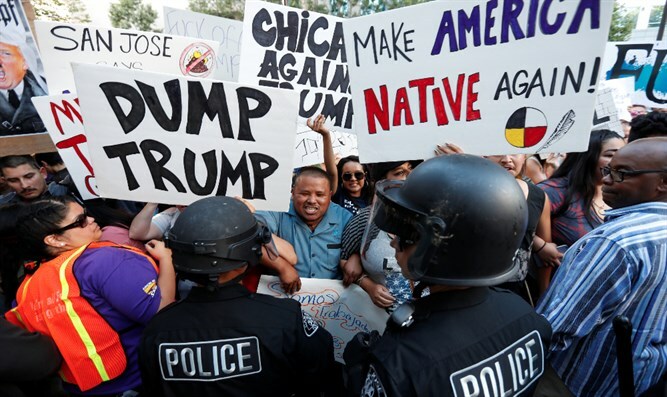 Thousands of people took to the streets Wednesday night to protest Donald Trump’s election, chanting anti-Trump slogans and wreaking havoc in major cities, according to Fox News, despite Hillary Clinton's call for unity and affirmation that she accepted Donald Trump as her president. Similar protests erupted in New York City, Philadelphia and Boston, with thousands more flooding the streets chanting anti-Trump slogans. Police installed barricades outside Trump Tower in New York to keep demonstrators at bay. Hundreds of protesters gathered near Philadelphia's City Hall despite the cold weather. In Boston, thousands of anti-Trump protesters streamed through downtown, chanting "Trump's a racist" and carrying signs that said "Impeach Trump" and "Abolish Electoral College." In the Midwest, protesters gathered in Minneapolis, Omaha, Nebraska and Kansas City Missouri. The Des Moines Register also reported that Iowa’s capital city saw some people protest as well, though it was kept to small numbers. Marchers protesting Trump's election chanted and carried signs in front of the Trump International Hotel in Washington, D.C. Many chanted "No racist USA, no Trump, no KKK. Another group stood outside the White House. They held candles, listened to speeches and sang songs. Dozens of Dallas activists gathered outside the city's sports arena, the American Airlines Center. In Oregon, dozens of people blocked traffic in downtown Portland, burned American flags and forced a delay for trains on two light-rail lines. A Trump supporter at a counter-protest was violently attacked. Several thousand chanting, sign-waving people gathered in Oakland, California. A night earlier, in the hours after Trump won the election, Oakland demonstrators broke windows and did other damage. In San Francisco, hundreds are marching along Market Avenue, one of the city's main avenues, to join a vigil in the Castro District, a predominantly gay neighborhood while Los Angeles protesters shut down the Highway 101 freeway and burned a giant paper mache Trump head in protest on the steps of City Hall. Hundreds massed in downtown Seattle streets. Many held anti-Trump and Black Lives Matter signs and chanted slogans, including "Misogyny has to go," and "The people united, will never be defeated." In New York, several groups of protesters caused massive gridlock as police mobilized to contain them. They held signs that read "Trump Makes America Hate" and chanted "hey, hey, ho, ho Donald Trump has got to go." and "Impeach Trump."